Tell Congress you care about circus animals' welfare with a letter today! Home » Tell Congress you care about circus animals with a letter today! Tell Congress you care about circus animals with a letter today! Ringling Bros. Barnum & Bailey’s circus has gone out of business. Municipalities all over the US are banning or restricting the use of wild animals in circuses. Times are indeed changing. The general public is realizing the inherent cruelty of caging and transporting circus animals most of their lives, simply for entertainment. On March 28, 2017, Representative Ryan Costello (R-PA) and Representative Raúl Grijalva (D-AZ) reintroduced H.R. 1759, The Traveling Exotic Animal and Public Safety Protection Act (TEAPSPA), to amend the Animal Welfare Act. 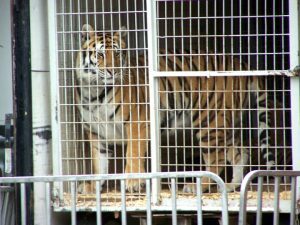 This bill restricts the use of exotic and wild animals in traveling circuses and traveling performances. But the bill and the animals need your support! Find out who your Congressional representatives are HERE. Over 30 countries around the world have adopted national legislation prohibiting or restricting the use of wild and exotic animals in circuses, with hundreds of local bans in place worldwide – over 200 in the UK, and hundreds in Europe and South America, as well as Asia. The time is now to act! Please follow the will of your compassionate constituents and be a leader in Congress to work toward protections for circus animals. Over 30 countries around the world, including Austria, Denmark, Sweden, Portugal, Singapore, Costa Rica, Peru, Bolivia and others, have adopted national legislation prohibiting or restricting the use of wild and exotic animals in circuses, along with hundreds of local bans in place worldwide – over 200 in the UK, and hundreds in Europe and South America, as well as Asia. I am therefore respectfully asking you to join with other members of Congress to begin the work of addressing this issue here in the United States. 1. Traveling circuses cannot meet the complex needs of wild animals. Animals in traveling circuses endure confinement, physical and social deprivation, long, arduous journeys, brutal control methods and physical violence. Keeping elephants in chains, confining wild animals like lions and tigers in small cages, and forcing them to perform unnatural tricks for the sole purpose of human amusement is increasingly difficult to justify in our advanced society. 3. Wild animals in traveling circuses are suffering. Objective measures that determine the well-­being of a wild animal and a review of the scientific literature reveals that, even with the best of intentions, the traveling circus cannot provide an environment that meets the basic welfare needs of exotic animals. Traveling circuses deprive animals of space, exercise and the ability to move around and perform their natural behaviors – which are all necessary to maintain mental and physical health. Abnormal, stereotypic behavior, such as tigers pacing endlessly in their cages, or elephants repeatedly swaying or bobbing their heads, are common behavioral abnormalities in circus animals, which indicate that they are not coping with the environment in which they are being held. They suffer mentally and physically as a result. 4. Traveling circuses pose a serious threat to public safety. Keeping wild animals confined, under duress and in dangerously close proximity to the public in lightweight, temporary enclosures has proven disastrous. Circus workers, and members of the public, including children, have been killed and maimed by circus animals, and lions, tigers and elephants have all escaped. 5. Diseased animals pose public health risk at traveling circuses. An estimated 12% of Asian and 2% of African elephants in North America have a tuberculosis (TB) infection, a contagious disease that can be passed from elephants to humans. Documented cases have confirmed transmission of TB from elephants to humans. 6. Enforcing the Animal Welfare Act is fraught with difficulties. 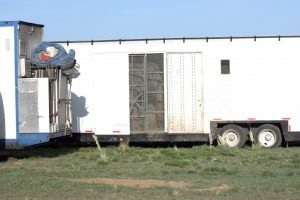 The transient nature of traveling circuses, where both animals and their handlers constantly change, combined with continuous travel across the country, makes law enforcement difficult. The practical difficulties of maintaining standards, inspecting, gathering evidence and ensuring compliance with animal welfare legislation justifies the restriction on the use of wild animals in traveling circuses. And no amount of costly government oversight can prevent accidents and physical abuse, or protect wild animals traveling for months on end in small, temporary accommodations. 7. Constituents want to see wild animals protected. Circuses, like all American businesses, have to change with the times to stay relevant and profitable. An educated public prefers to see humane entertainment and human-­only circuses are thriving. Take for example Cirque du Soleil, which has grown from one show in 1990 to 19 shows performing now in 271 cities, with seven separate shows on stages right now in Las Vegas alone, and generating an estimated annual revenue exceeding $810 million. 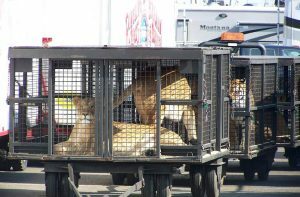 In sharp contrast, Piccadilly Circus, a traveling circus that still uses wild animals, in recent years canceled shows across Southern California due to poor ticket sales. 8. The show, and jobs, will go on. Recent studies have shown that of a two-­hour show, wild animals appeared for less than 15 minutes. So circuses can re-­tool. Research into working practices at circuses show that most circus workers have multiple roles, and staff could be retrained as the circus evolves away from exotic animal acts so jobs are not lost. Circus Vargas removed their animal acts and the business continues, as it can for any circuses traveling in the U.S. that wants to keep pace with their patrons’ growing preference for cruelty-free entertainment. 9. TEAPSPA will likely be good for the economy and save money. A survey in the UK established that a sharp decline in animal circuses was matched by a steady rise in human-­only circuses, and a comparison in the U.S. of ticket prices at both circuses with, and without animals, show that removing wild animal acts could actually increase the circuses’ bottom line. Ringling Bros. Circus, in a landmark settlement with the USDA, paid out an unprecedented $270,000 penalty related to alleged violations of the Animal Welfare Act based on inspections and complaints dating back four years. Costly fines and animal care expenses will be eliminated with TEAPSPA. Taxpayer money dedicated to costly USDA inspections will be saved for use elsewhere and Americans will no longer have to pick up the tab for government licenses and expensive inspections of these animals. Please support the Traveling Exotic Animal and Public Safety Protection Act. 10. TEAPSPA is a narrowly focused and well-reasoned step forward for animal protection and public safety. Thirty four countries, including Austria, Bolivia, Colombia, Costa Rica, Czech Republic, Denmark, Greece, Malta, Peru, Portugal and Sweden have taken national action. More than 63 cities and counties in 27 states across the U.S. have ended wild animals in traveling circuses including Southampton, NY, Green Bay, WI, Richmond, MO, San Francisco, CA and most recently, Jersey City, NJ. No amount of expensive regulation will protect a wild animal in a traveling circus from a life of ongoing deprivation, such as an elephant chained by the leg for hours on end or a tiger confined for months to a tiny cage. A life that is punctuated by moments of physical violence delivered by a frustrated handler or a trainer who demands compliance. TEAPSPA will relieve an enormous amount of suffering, save resources and protect people.